The best in commercial and residential pool and spa lighting. Visual Aquatics is a lighting manufacturer that creates innovative lighting solutions for the pool and spa applications as well as for the specialty landscaping lighting industry. By implementing the latest technologies like fiber optics and LED’s or Light Emitting Diodes, which are energy efficient and offer ultra long life and low maintenance, Visual Aquatic’s customers gain an economic benefit, while simultaneously achieving a unique and individual look or design. Visual Aquatics continually pushes the boundaries of what is thought possible, while employing innovative technologies and practices that are sensible and sustainable in today’s environmental and economic climate. With the new lighting technologies, such as LED technology, and the increasing demand for energy efficient solutions, Visual Aquatics will continue shaping the future with groundbreaking new pool and spa lighting applications. We Specialize in developing and manufacturing a large array of pool specialty lighting and non lighting products. With a team that consists of design engineers, mechanical engineers, electrical engineers, inventors, installers and resources specialists we are one of the few pool Lighting companies that still manufacture 75 percent of our products in the USA.Our capabilities include Injection Molding, Extrusion, CNC routing table, CNC Machining, Electronic Pick and place Machine and Soldering stations. With our Just in Time (JIT) Inventory System we are one of the few manufactures that put suppliers right into our assembly lines. We have a full Plastic fabrication division which let’s us make innovative pool light and landscaping fixtures fast. 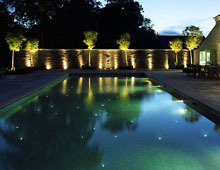 We provide our customer with the latest pool and landscaping lighting innovation. With our quality control division, Visual Aquatics. tests every product before introducing it to the market. We are proud to have partnered with leading lighting manufacturers around the globe to provide and ensure our customers with a variety of innovative technologies and other products that are yet to be seen in the marketplace. Our company has done many custom projects such as installing Fiber optics and Led componets into pools, spas and other landscaping lighting. IVisual Aquatics has a network of Factory representatives, Distributors and Installers all over the world. It is a partnership that has worked for many years. We provide business tools to start, maintain and grow your business.Your company will also have the benifit of our Knowledge and experience. Visual Aquatics Inc is a manufacturer and distributor of Fiber Optic and LED lighting products for the commercial and residental pool and spa markets around the world. With over forty years of combined experience ImVisual Aquatics is the most experienced company in the world in the field of Fiber Optic and LED lighting. We supply fiber optic products such as; pool perimeter lighting, step lighting landscape lighting and Fiber optic fixtures (Bubblers, Feature lighting, Pavers, and leminars). Visual Aquatics supplies color changing LED pool and spa lighting, step lighting, and LED landscape lighting. Visual Aquatics supplies a lit and unlit waterfalls. Visual Aquatics supplies custom outdoor light shows that combines music and light which results in a orchestrated symphony of light. Visual Aquatics supplies general pool and outdoor lighting and fixture.